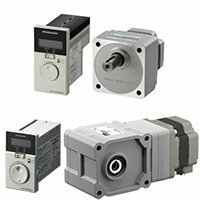 Brushless DC motor systems combine compact yet powerful brushless DC motors and high performance drivers to offer excellent energy savings and speed stability as well as a wide speed control range. 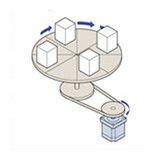 With brushless DC motors you can downsize your application as the motors have slim bodies and provide high power due to permanent magnets being used in the rotor. 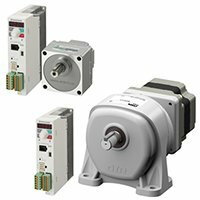 Brushless DC motors from Oriental Motor can achieve up to 5159 lb-in of torque when combined with a standard geared option. 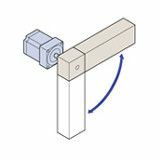 Their space saving design contributes to a compact and powerful solution ranging from 15 W up to 400 W. Their flat torque characteristics can produce the same rated torque at wide speed range. 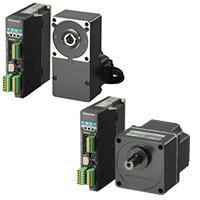 Brushless DC Motors (BLDC Motors) also feature a wide variety of pre-assembled geared and electromechanical brake options and are available with our industry leading stable lead times. 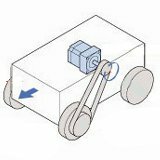 Brushless DC motors use permanent magnets in the rotor of three-phase motors. In addition, on the inside of the stator, there is a built-in hall effect IC (magnetic sensor) that detects magnetic field changes with the permanent magnets, The feedback signals from the hall effect IC of the motor are compared with the setting speed by the driver and the motor speed is adjusted continuously. 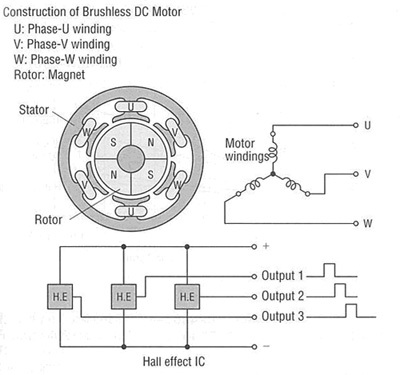 The brushless DC motor features a coil is star-wired (Y-wired) with three-phases: U, V, and W and is located in the stator, and the rotor is made of magnets magnetized in a multi-pole configuration as shown in Fig. 1. Inside the stator, three hall ICs are arranged as magnetic elements so that the phase difference of the output signal from each hall IC will be 120 degrees apart for every rotation of the rotor. 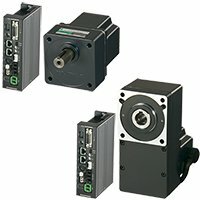 Brushless DC Motors (BLDC Motors) are very compact and when mated with a gear head, can produce a large amount of torque. 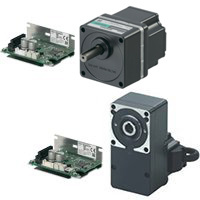 The compact yet powerful brushless DC motor incorporates permanent magnets in the motor rotor. 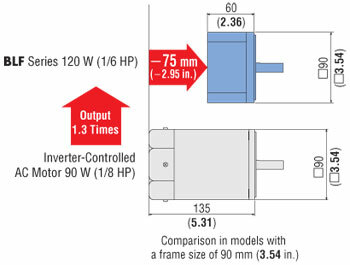 Compare with an AC motor having a frame size of 3.54 in. (90 mm), a brushless DC motor of the same specifications is 2.95 in. (75 mm) shorter and offers 1.3 times more output. 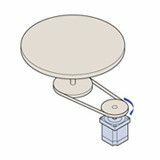 The compact motor structure lets you downsize your equipment. 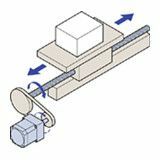 Brushless DC (BLDC) motors, which incorporate permanent magnets in the rotor, generate little secondary loss from the rotor. 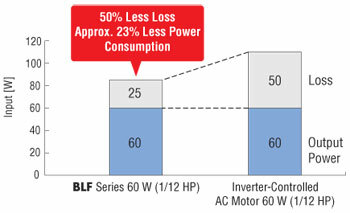 At an output power of 1/12 HP (60 W), for example, the power consumption of the BLF Series Brushless DC Motor is approximately 23% less than that of an inverter-controlled AC motor, which enables the energy-saving operation of your equipment. 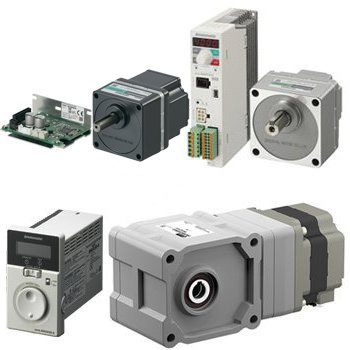 Brushless DC motor systems are available with electronic-input control. The driver can be connected directly to a programmable controller. 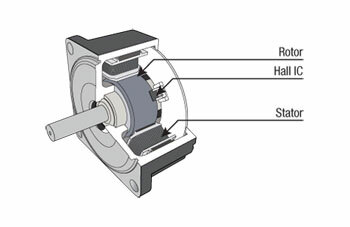 As the motor requires no power relays, there is no need for periodic service or replacement of relays. this makes the machine highly reliable. 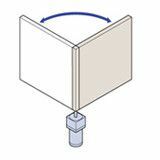 Moreover, the time required to set up the motor is greatly reduced. 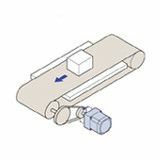 Removing the relays eliminates the spark noise during opening and closing of the relay contact points. 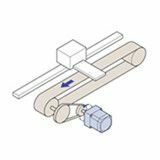 The Brushless DC Motors (BLDC Motors) do not utilize brushes, which often require replacing and/or maintenance, saving time and cost.